2013 seem to have been a busy year for François Schuiten and Benoît Peeters. 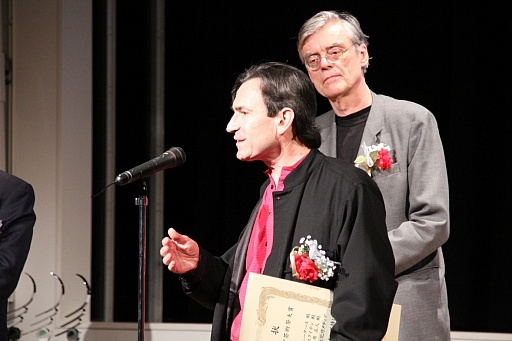 For their first Japanse translated bundle of stories of the Obscure Cities they received the prestigious Grand Prize Manga at the Japan Arts Festival. A tour and exhibition in Tokyo where part of the prize. After the first two bundles, in 2013 also the third and fourth bundle were published. Schuiten and Peeters were invited several times to tell stories with images and music like Demain and Rêves d'Archives. And a new short story about Max Morton was published in Japan. In 2013 François and Benoît did also some solitary work. Benoît Peeters gave a series of lectures in Brussels on comics and movies. One of the topics during these lectures was Rodolphe Töpffer on who Benoît gave some separate lectures later in 2013. Due to several foreign translations of Benoît Peeters’ book about Derrida, he visited several countries in Latin America to give lectures about this topic. Besides Latin America, Benoît Peeters also visited Fribourg, Stockholm, Lyon and The Hague to give lectures. François Schuiten did the Google doodle remembering Henry van de Velde, he gave a live performance on the Foire du Livre in Brussels and François worked together with Paul Bourgois and Colin Toupé on Les Lumières Alexandrines a scenography for Mediterranees in Marseille. A new mural in Brussels was finished and reveled in summer. An image of François Schuiten was subject of some discussion around an exhibition in the Flemish parliament. Other new work of Schuiten includes the Oh, ce sera beau ! and Le Cimetière des locomotives. François Schuiten worked on several movies in 2013. The Greek Memory Reloaded was released with graphic design by Schuiten. Schuiten did also the design of the Canadian movie Mars et Avril by Martin Villeneuve. The movie was shown at BIFFF in Brussels and later in several other cities like Amsterdam. Villeneuve was invited for TED 2013 to talk about this project. Villeneuve, Schuiten and Sokal are now working on a new project: Aquarica. 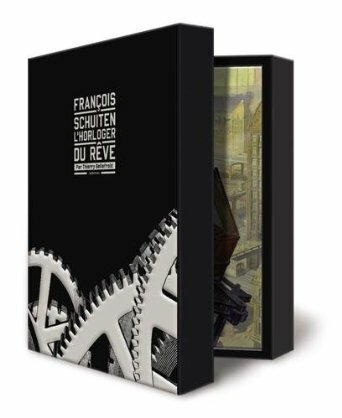 Probably the biggest story in 2013 was the donation by Schuiten and Peeters of all the original pages and artwork of their albums to the National Library of France (Bibliothèque nationale de France) and the King Baudouin Foundation (Fondation Roi Baudouin). Also Maison Autrique, the Centre belge de la Bande dessinée, le Centre de l’Image de La Louvière and the comic museum of Angoulême will receive certain parts of Schuitens work. François and Benoît want to ensure the possibility of quality reprints of their work in the future, avoiding separation by a forced sale of the artwork after their death. BNF held a meeting to celebrate the gift. New exhibitions about this gift will be held in Brussels and Paris in 2014. 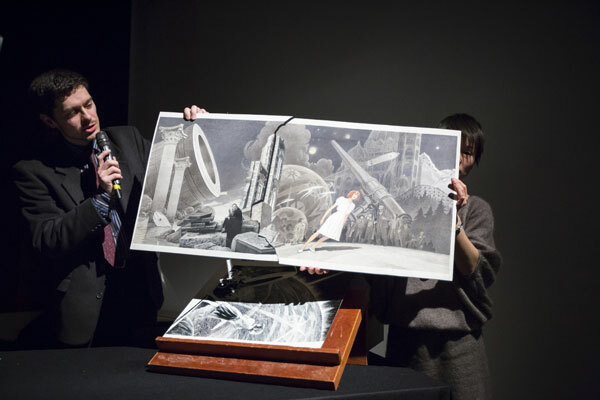 The single images made by François Schuiten are not part of the gift and 30 of them were sold in an unique auction in Paris. Besides the rerelease of La Théorie du Grain de Sable the Japanse release of La Douce and the German rerelease of La Fièvre d’Urbicande, there was a lot of news in 2013 on the English translation of L’Enfant Penchée. Funded by a Kickstarter project, Steve Smit of Alaxis Press made an English translation possible, giving Schuiten and Peeters access to an even larger audience. The English version will be released early 2014. 2013 was also the year that Mary von Rathen showed up again. During a radio documentary, a letter by Mary was found. 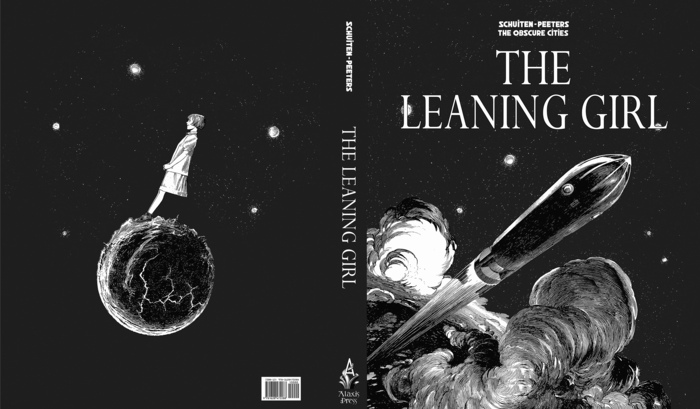 Casting more shadows on her existence since the Correspondances between her and Schuiten & Peeters was published. At the end of 2013 a monograph about François Schuiten was published by Casterman. The monograph is written by Thierry Bellefroid. Along side the monograph, Bruno Letort released his compilation album of music he has made over the years for the Obscure Cities. François Schuiten in "Music and Men"